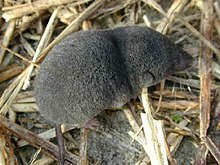 For other uses, see Shrew (disambiguation). ^ Hutterer, R. (2005). Wilson, D.E. ; Reeder, D.M. (eds.). Mammal Species of the World: A Taxonomic and Geographic Reference (3rd ed.). Johns Hopkins University Press. pp. 223–300. ISBN 978-0-8018-8221-0. OCLC 62265494. ^ a b c Barnard, Christopher J. (1984). Macdonald, D. (ed.). The Encyclopedia of Mammals. New York: Facts on File. pp. 758–763. ISBN 0-87196-871-1. Wikimedia Commons has media related to Soricidae.